The European Commission is expected to release a report this week alleging that Ireland provided illegal "state aid" to Apple when it set tax rates for the company in 1991 and 2007, part of a series of investigations it hopes to use to retroactively tax corporations operating from countries with tax incentives. 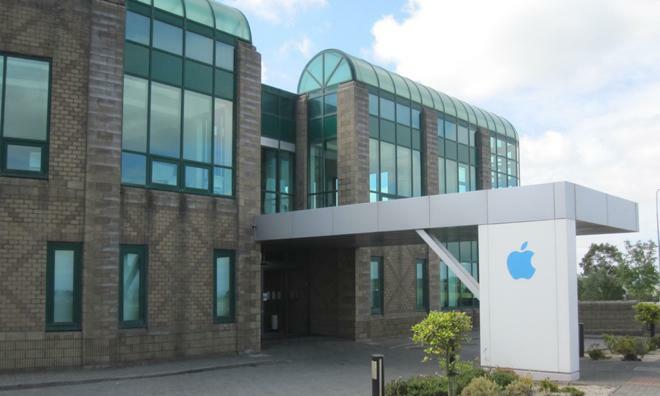 Apple has operated international operations from a subsidiary located in Cork, Ireland since 1980. 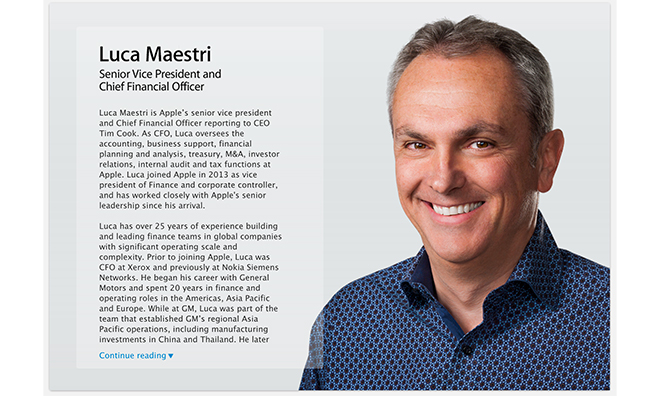 According to a report by the Financial Times, Apple's new chief financial officer Luca Maestri stated that the company "sought a meeting with the Irish authorities after a change in the law" in 1991, and reached a new agreement on taxation that continued until 2007. Prior to 1991, the company's Ireland subsidiary operated tax-free. As Apple's overseas operations and sales began to grow dramatically alongside the new iPhone, Ireland "approached Apple to revise its tax arrangements to reflect the growth and new functions," the report stated. Maestri said Apple asked for an "advanced opinion" to deliver "complete certainty" about the company's tax liabilities. Maestri also noted that Apple has recently invested $100 million into its Irish operations, and is one of Cork's largest employers. In working out both agreements with Ireland, Maestri stated "we were simply trying to understand what was the right amount of taxes that we would have to pay in Ireland," an approach he called "very responsible, transparent and prudent." Maestri further stated, "If countries change the tax laws, we will abide by the new laws and we will pay taxes according to those laws." He also told the Financial Times that Ireland has increased its corporate income taxes more than ten times since 2007, and added, "we stayed in Ireland during difficult times and during great times." Because the OEDC can't force Ireland's participation, the EC has devised a plan to accuse the country with providing anti-competitive "state aid," a new theory it hopes to use to collect taxes from companies that have organized a legal presence in countries with lower tax rates. The taxation plan hinges on the idea that specific countries have created favorable tax deals with certain companies in way that hurts competition. In addition to Ireland's taxation of Apple, the group is also specifically targeting Dutch taxation agreements with Starbucks and the way Luxembourg taxes Fiat's financial group. Ironically, the new policies alleging "state aid" are being pushed by Germany and France, which worked together to create and subsidize Airbus with below market rate loans that were deemed improper government subsidies by the World Trade Organization after protest from Boeing. The EU is particularly concerned about Apple after seeing its own domestic mobile industry crumble in the wake of the iPhone, particularly Nokia, Ericsson and the fledgeling Symbian Foundation. Following Microsoft's acquisition of Nokia, it laid off thousands of the struggling firm's remaining workers. Apple says its taxation agreements with Ireland do not break any laws. Maestri specifically was cited as stating that "there's never been any special deal, there's never been anything that would be construed as state aid." Ireland also denied any wrongdoing in its agreements with Apple. Maestri said, "we know that we didn't do anything that was against the law and we are very confident that through the investigation it will be shown that there was no selective treatment in our favor at any point in time," adding, "it's very important that people understand that there was no special deal that we cut with Ireland. We simply followed the laws in the country over the 35 years that we have been in Ireland." Apple maintains that the EC's attempts to retrospectively impose new tax policies through its OECD investigation are also invalid because Ireland hasn't adopted the policies. Other EU countries that have adopted the policies have only done so since 2010. Apple also argues that the tax rates it pays in Ireland are appropriate and comparable to those paid by other companies of its size. Writing for the Financial Times, Tim Bradshaw portrayed Apple as a tax scofflaw. He claimed that that during U.S. Senate hearings, "it emerged that Apple shifted billions of dollars in profits out of the US to international subsidiaries with no declared tax residency," and then insinuated that it was only Apple's opinion that it pays all the tax it owes under existing laws. Last year, Apple's chief executive Tim Cook testified to the U.S. Senate that Apple had paid $6 billion in U.S. federal taxes over the previous year, the most taxes paid by any American corporation and "1 out of every 40 dollars in corporate income taxes collected by the U.S. government." Apple's most recent 10K filings state the company paid an effective tax rate of 26.2 percent in 2013, and accounted $9.1 billion in "cash paid for income taxes, net." In comparison, Google's 10K reports that it paid an effective tax rate of just 15.7 percent in 2013, due to "federal research and development credit related to the American Taxpayer Relief Act [Bush Tax Cuts]." Microsoft's 10K reports paying an effective tax rate "approximately" 19 percent, a exceptionally low rate "resulting from producing and distributing our products and services through our foreign regional operations centers in Ireland, Singapore, and Puerto Rico." Cook also encouraged Senators to reform U.S. tax laws in a way that would enable Apple to import its foreign earnings for domestic use, a sum that now sits at over $160 billion. "The tax code has not kept up with the digital age," he stated. He recommended taxing foreign earnings in the mid 20s percent range, similar to the tax rates in South Korea. Under current U.S. tax law, companies do not have to pay U.S. taxes on foreign earnings if those earnings remain invested overseas. However, if they are imported, they face an immediate charge of 35 percent, one of the highest corporate tax rates in the world. That policy effectively prevents Apple and other multinational companies from spending their foreign earnings in the U.S.
Samsung's effective tax rates are in the low teens (12-16 percent) due to favorable exemptions from the South Korean government that set the conglomerate's tax rate far below that of other companies operating in the country. South Korea has not adopted OECD policies on tax rates. The South Korean government is also not parading Samsung executives into hearings that demand to know whether the company pays more taxes than the law requires; it has instead pardoned the company's chairman of multimillion embezzlement and tax evasion convictions so that he could both avoid prison and "retain his membership at the International Olympic Committee." 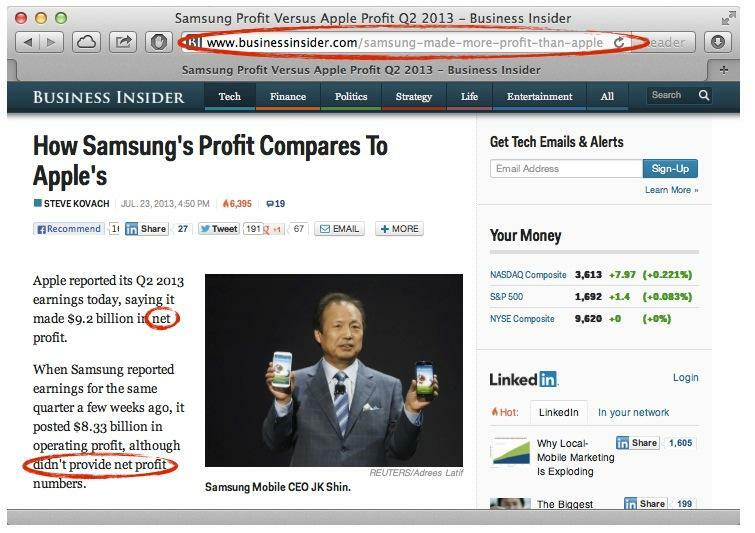 Samsung's taxes are so low that a variety of bloggers (including Business Insider) confused the company's pre tax operational profits with Apple's taxed net profits, falsely concluding that Samsung Electronics had earned more money than Apple. It actually earned less, but paid so much less in taxes to its government that it kept more of its profits, nearly as much as Apple. Samsung's profits have since collapsed. FT claims Apple "rode to riches" in foreign earnings "with the help of the Irish taxpayer"
Speaking in the sensational language commonly used by the Financial Times, Bradshaw described the EU's tax plan as "an accusation that Apple rode to riches totaling $137.7bn in offshore cash with the help of the Irish taxpayer," and said the EC's upcoming report "will come as a blow to a company that has striven to burnish its image of corporate social responsibility in recent years." Bradshaw further imagined that if the EC is successful in pushing its "state aid" charges against Ireland, "it has the power to order Ireland to recoup 10 years of the illegal support." He then also added that Maestri said it would be "speculative" to estimate the potential windfall the EC might demand before the outcome of any investigation is reached.